Watching it with a few family members, it’s astonishing how the film never feels cheap or tacky. In the age of big screens and high definition, it’s easy to see the flaws. I caught the early technicolour War of the Worlds a few weeks back and though its visual design was impressive it was hard to get past the fact that I could see the strings. Special effects traditionally don’t age well (even some of the CGI on Titanic looks dated – I wonder how Avatar will look in a decade). 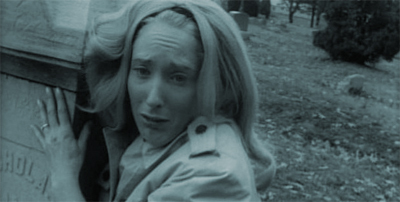 And yet The Night of the Living Dead has aged well – perhaps better than any of its sequels or spin-offs. The key, I suspect, is modesty. There are no models or special effects. The closest we get is some decay effects delivered by make-up and some torn clothes – maybe the occasional gunshot wounds. None of the creatures that stalk the living suffer particularly complex signs of decay and the film doesn’t call for elaborate special effects. Indeed, many zombie aficionados will be shocked by the relatively low bodycount. What gore there is – the beasts feasting upon the flesh of their living brethren – is harrowingly and disturbing photographed in black and white, but shot just about ambiguously enough that we don’t really notice if they’re chowing down on chicken drumsticks. However, the bulk of the movie focuses on the survivors rather than those things hunting them. That’s the aspect of this particular genre that gets frequently forgotten in the shuffle (while the best films remember it). These stories aren’t really creature features so much as they are tense and intimate human dramas. What survives past the end? What will we give up of ourselves in order to survive? Is surviving even enough? When the chips are down and our lives are at stake, can you trust those around you? The best scenes in the movie follow the movie’s protagonist, Ben, and the father of a family hiding in the basement of the house where he has taken shelter, Mr. Cooper. Ben believes the group can work together and all members can survive, while Cooper’s concern stems solely to his own family. And here we have Romero’s famous social commentary. While much as been made of casting Duane Jones, an African American actor, in the lead role amid an otherwise white cast, Romero has traditionally played down the significance of the actor’s skintone. According to Romero, Jones “simple gave the best audition” and it’s an argument that’s easy to believe. Jones is wonderfully effective as the lead character (and significantly stronger than most of the rest of the cast). However, the movie’s central exploration is the construction of middle-class family values. While in the sequels Romero would use a shopping mall to criticise capitalist extravagance or a military base to skewer the military-industrial complex, here he sets the action in a small farmhouse under siege and juxtaposes the “wholesome” traditional values of the characters hiding in the basement, waiting for the crisis to pass – with the middle-class Cooper family and the two college sweethearts – with the more proactive and urgent outcasts – be it the decidedly working-class Ben or the single Barbara (and even Barbara spends most of the movie in a near-catatonic state). It’s these moments of drama which underscore the movie and lend it the power. Like many of the best horror or science-fiction films (and it arguably is a science-fiction film, with aliens being behind the attacks in the first draft of the script and talk of “mysterious radiation” from outer space in the movie), its power comes from the issues it addresses directly and indirectly. Much as Invasion of the Body Snatchers was a condemnation of both communism and the witch hunts around it and The Day The Earth Stood Still spoke to the collective dread of nuclear weapons, The Night of the Living Dead is a powerful exploration of class distinctions in the America of the time. From a zombie point of view, it’s interesting to note how humble the film is in essentially creating these creatures. There’s a sense that these monsters aren’t yet fully formed – you’ll notice, for example that the first zombie we find is capable of small bursts of speed (dashing around the car to attack Barbara), in marked contrast to the later walking dead featured in Romero’s work. In a way, the creatures themselves are almost a secondary concern – the movie awkwardly shoehorns in some exposition in the middle that feels like somebody realised they needed to explain these monstrosities. 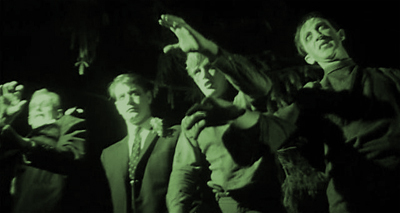 The word “zombie” is not used – the media in the film (and the characters) refer to the stumbling forms as “the ghouls”. Initially it seems that movie is more fascinated by the impact of these ghouls rather than the creatures themselves – with reporters commenting on “a sudden general explosion of mass homicide”, before covering “creatures who feast on the flesh of their victims”. It’s nice that the creatures are kept somewhat ambiguous – even though the film seems to heavily push the “space radiation” explanation, again in marked contrast to later zombie films that liked to keep the cause of the plague ambiguous (even whether it was spiritual or biological). That said, the movie is dated in some ways. As fascinating as Romero’s social commentary is, it’s hard not to notice that the bulk of the female cast seem to exist passively. Judy and Ms. Cooper in particular seem to be incapable of independent thought, and Barbara is wholly unable to function in the midst of the horror unfolding. I know Romero is commenting on the patriarchal nature of modern society, but there’s nothing to contrast it against – while Ben’s social values conflict with those of Cooper, Barbara just sits there on the couch mumbling to herself. Perhaps the best aspect of Romero’s 1990 remake would be an attempt to rectify this. Still, The Night of the Living Dead is a classic, and it holds up well. It’s a harrowing little horror tale that is just as effective today as it was on its initial production. Perhaps more than any of Romero’s films (including his newer ones), it still holds together even after all these years. I’d consider Night if the Living Dead to be on the same level as Psycho, in terms of quality and importance.